Every once in a while we will spot a location that we know is based on a novelty idea. Some we pass up, but then there are the ones that just hook our attention and yell out for us to visit. 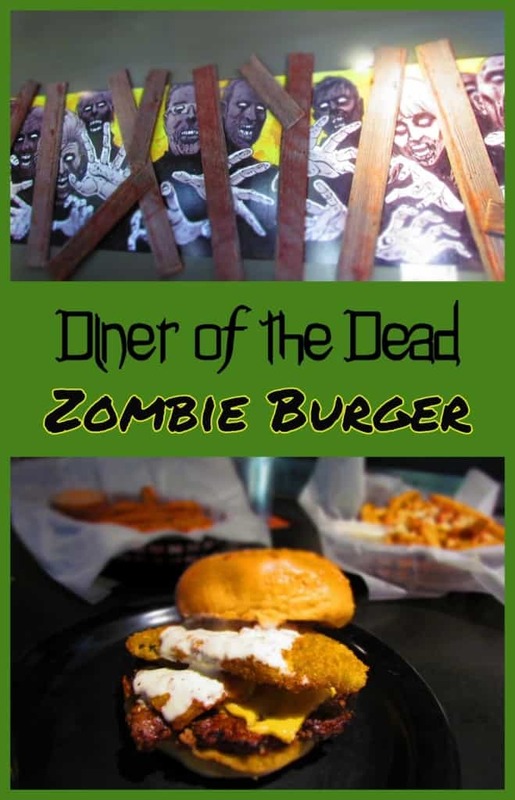 This is exactly what happened when we spotted Zombie Burger during our preview of Des Moines, Iowa. When we put out our feelers for ideas on restaurants to visit, this one got mentioned quite a bit. While it did get mixed reviews, the theme sealed it for us. Where else could we experience flavors to wake the dead? We want to thank the Travel Iowa and Catch Des Moines for their hospitality. Rest assured that all opinions are our own. We were seated in the bar area, so it gave us a good view of the dining room. All around us we watched plate after plate of delectable dishes being delivered. We scanned the menus, which are designed like a copy of a local newspaper. With around 30 burger options, it took us a bit to finally decide. A discussion with the bartender was helpful, as she pointed out some of her favorites. Crystal finally rested on the La Horde. This all beef burger is topped with caramelized onions, bacon, goat cheese, and mayo. She opted for the Sweet Potato Fries as her side dish. They are served with a tangy sauce that added a nice little kick. 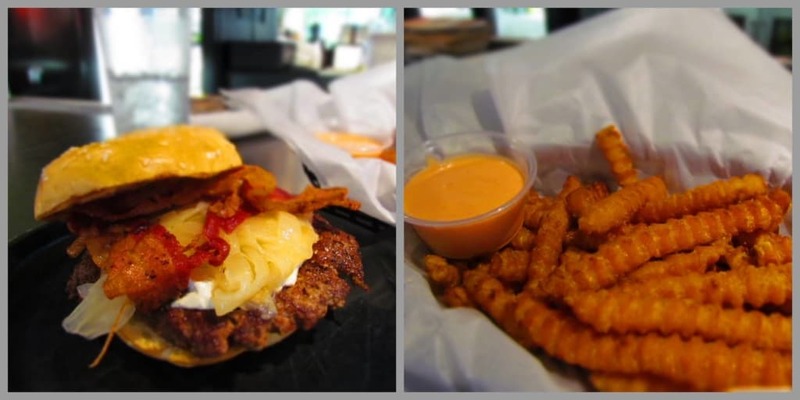 When I reached out to Zombie Burger, I was informed that the most popular burger was The Walking Ched. I discovered that the bun is actually made of deep fried macaroni and cheese. This sounded like it would be a little difficult to hold, and I was really in the mood for a handheld sandwich. (The person beside us ordered it and had to eat it with a fork, so I was correct.) I still wanted something completely out of the ordinary, so I chose the Trailer Trash Zombie. This little monster comes with the same style patty, but is loaded with some unique toppings. 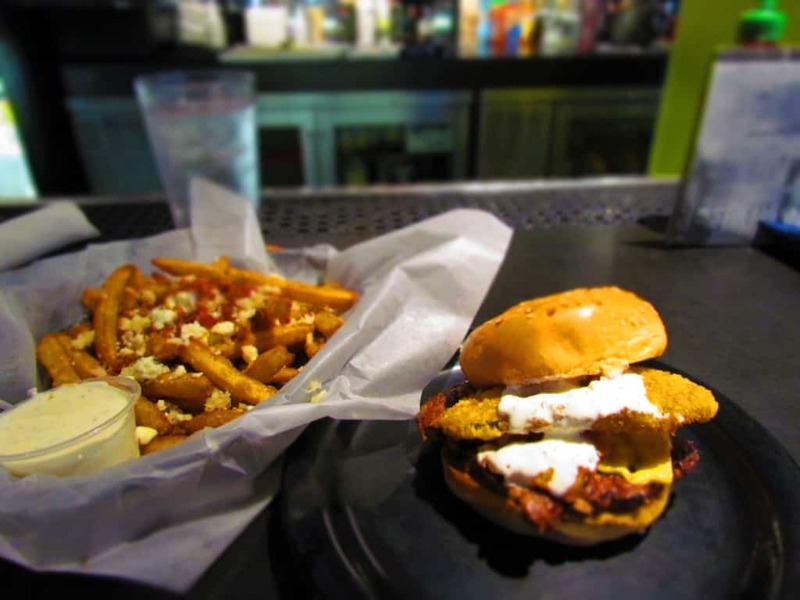 American cheese, fried pickle, ranch dressing, cheese curds, and even some chicken fried bacon crown this burger. It was a delicious dish destined for undead distinction. (Okay, I’ll watch the alliterations.) The need for a side dish that could match the flipped out flavors of my sandwich was apparent. Scanning the menu, I located the Garlic Bacon & Blue Cheese Fries, which seemed like a perfect compliment to the ranch dressing. Sure enough, I couldn’t seem to get enough of this combination. Of course, I finally had to stop eating for fear of being able to walk, and possibly being mistaken for one of the undead hosts. Prior to our visit, every conversation we had about Zombie Burger always included a description of one of their signature shakes. We certainly weren’t going to let this opportunity pass us by, so we decided to sample a couple of options. Once again, I was the one to show my creative flair by ordering the most unusual item I could find on the menu. 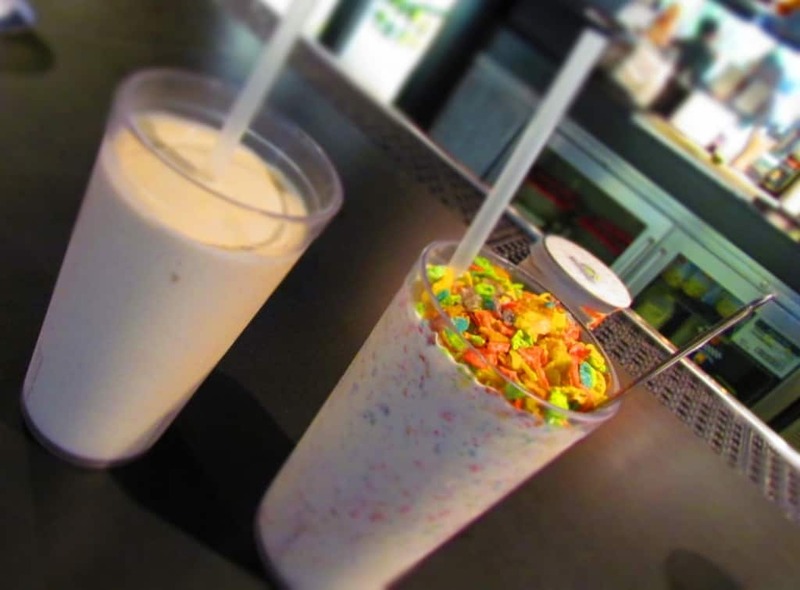 The Zombie Unicorn is comprised of vanilla ice cream, marshmallow cream, and a serious dose of Fruity Pebbles. They gave me a straw, but let’s get real. It took a spoon to down this magical treat. Crystal went vanilla on me, well kind of. She ordered the Peanut Butter Banana, which is pretty self-explanatory. Although it was fairly plain looking, it had a delightful flavor. By the end of our visit, we were both a little wobbly from the high concentration of delectable dishes we consumed. We may not have been the walking dead, but we were certainly close to being a cadaverous couple. 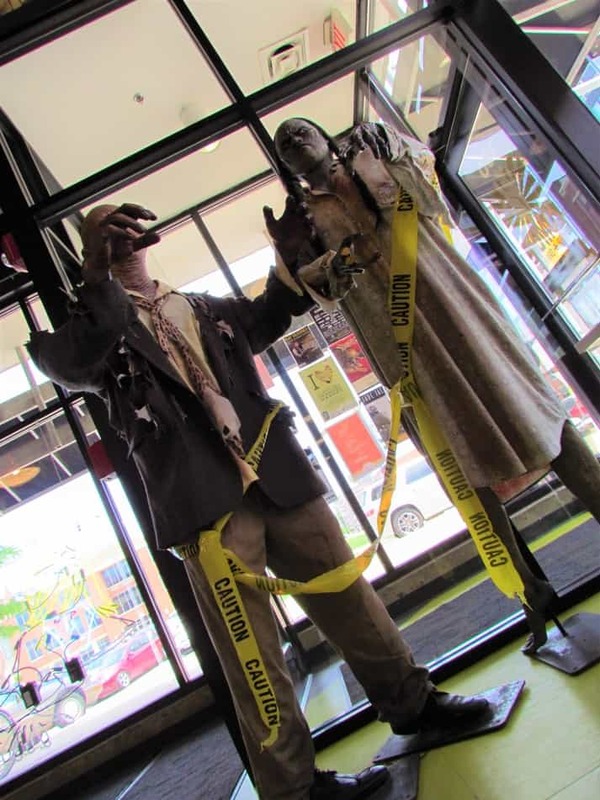 What do you think about a zombie themed dining experience? Would you be game? Share this article with your zombie hunting friends! Apart from decor and names, what is so zombie about the concoctions you sampled. Would it knock you dead? Would you knock the chef dead? I guess a lot of it is designed around the decor, but the flavor combinations of the food are quite unique. It would be a shame to knock the chef dead, after they delivered such an interesting menu. I think I prefer my lunch without cadavers and I’m currently off red meat, so this probably would not be the place for me. Did you both really manage to consume a burger, side and a milkshake? Mr. Excitement and I have become our parents. We would have to share a meal like this. Pathetic. We weren’t able to finish it all. It was quite filling, but fortunately we were walking around the city. That helped burn off the calories.